Singapore sees over 1 million international visitors each month, and it’s definitely not by gusts of wind setting unwitting travelers on the path towards our sunny island. Due to our vantage point (or lack of it), we tend to be unable to see exactly what appeals our country to travelers, with “Singapore got things to do meh” being one of our main complaints. Thus, there must be something the Singapore Tourism Board (STB), our ‘marketing team’ so as to speak, is doing right. What’s their winning strategy though? Gone are the days of television commercials which resemble our National Day song music videos, and the brutal truth that these days, many of us hardly think that brochures, regardless of how attractive they look, would be influential enough on our choices. Instead, STB has identified three main thrusts to its marketing strategy from 2016-2020 in a lengthy publication, which we have decided to summarise in part for you. Telling A Great Singapore Story: Focus on branding, collaborations with various industry partners and agencies (cross-sharing, content seeding). Creation of sustained and global campaign which allow for localised nuances. Targeting The Right Fans: Split travellers into different segments (working millennials, young families, active silvers, business travellers). Strengthening stronghold in Asia but also diversifying to other countries around the world. Enhancing Our Delivery: Delivery of the “right content and information to the right people, at the right time, and at the right place”. Utilising a Word-Of-Mouth tactic which is powerful due to its high trust factor – equip Singaporeans, residents and in-market fans with info; experiment with various platforms. With a vision to deliver “agile, bold and creative destination marketing that inspires and delivers results”, STB has also cleverly divided their approaches for those in the passive and active stage. 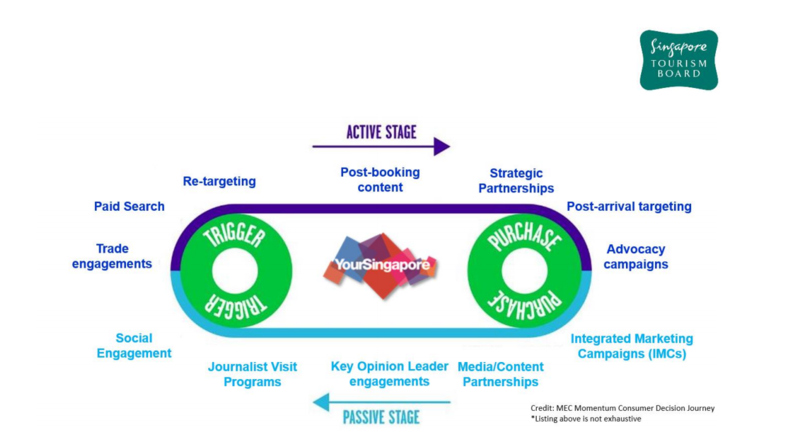 At the passive stage, the main goal is to shape Singapore as a potential holiday destination, and this is done via marketing campaigns, media and content partnerships and journalist visit programmes which “pre-disposes consumers towards Singapore”. At the active stage, the focus is to seal the deal on getting potential visitors over to Singapore. This would include “providing relevant tactical information when they are researching and considering, or through event marketing call-to-action elements”. Post-arrival marketing activities would also be carried out to help shape positive experiences that the tourists would be able to take home with them. With all this, and the vision to be creative in execution, it’s probably no surprise that STB has partnered up with ‘unconventional’ brands Lyft and Pandora as part of their plan to introduce Singapore to US residents – particularly, those in the passive stage. Marketing Interactive published an article yesterday talking about how STB has recently partnered up with Lyft, US’ equivalent of Grab or Uber; and Pandora, a music streaming and automated music recommendation service in their bid to “drive awareness of Singapore in US”. Lyft X STB’s strategy was simple – to give unsuspecting riders in San Francisco a chance to win a five-night, all-expenses paid trip to Singapore if they aced a Singapore-centric quiz. Olivia Hsiang, vice president of partnerships at Lyft, mentions that the partnership is mutually beneficial, and “will make travelling with Lyft even unique [since] surprising riders with trips to Singapore is the kind of spontaneity and engagement that our audience values”. On Pandora, a dedicated Singapore station with 80 tracks from at least 12 Singaporean artists has been created to introduce US music lovers to the diversity of Singaporean contemporary music. Some of the artists featured include The Sam Willows, Charlie Lim and THELIONCITYBOY. The curation was done in collaboration with Singapore music advocacy group, The Music Society, Singapore (SGMUSO), and the station will be available for download and play from November 2016. Not only millennials, but more and more of people in general turning to smartphone apps and online services to fulfil their various needs, so these collaborations are actually both niche and wide-scale at the same time. STB also revealed that these campaigns are actually “aimed at supporting Singapore Airlines’ launch of non-stop flights between San Francisco and Singapore in October”, which definitely plays to passive-active conversion in their strategy. As a heads-up, Singapore Airlines (SIA) will be launching non-stop flights between San Francisco and Singapore on October 23, and there is hope that the partnerships “will deepen destination awareness and inspire travel to Singapore from the West Coast”. Being Singaporean, I can’t help but feel overwhelming pride when those overseas express so much interest in our country, and personally can’t wait to see what else STB has in store!